Ground freezing is a soil stabilization technique carried out by continuously refrigerating the soil. Methods, applications and advantages of ground freezing is discussed. There are numerous ways and technique of soil stabilization for deep excavation or tunneling. Some of them are grouting, heat treatment method and many more. One of the common and popular method used in the recent times is ground freezing technique. Ground freezing is a process of converting pore water or pores into ice by continuously refrigerating the soil. The water bearing soil is very lose and doesn’t have enough compressive strength and shear strength to withhold its own loads. To increase these strengths and make the water bearing strata temporarily impermeable ground freezing method is used. This is usually done to provide structural underpinning, temporary support and prevent ground water flow into the site area. When the water-bearing strata is frizzed, the water in it transforms into ice which becomes a seal against the water and strengthens the soil. In grouting, extraneous materials are used. But in this method no extra material is required and after the work is completed, the soil reverts into normal state as before. This method can be use in any type of soil, regardless of size, shape or depth of excavation, soil or rock formation regardless of structure, grain size or permeability. However, it is best suited for soft ground rather than rock conditions. It is applicable to a wide range of soils but it takes considerable time to establish a substantial ice wall and the freeze must be maintained by continued refrigeration as long as required. The method of artificial ground freezing was found out by German scientist F. Hermann Poetsch, in 1883. It was first used in America in Chapin Mine Company in Iron Mountain, where freezing was performed to a depth of 100 feet. 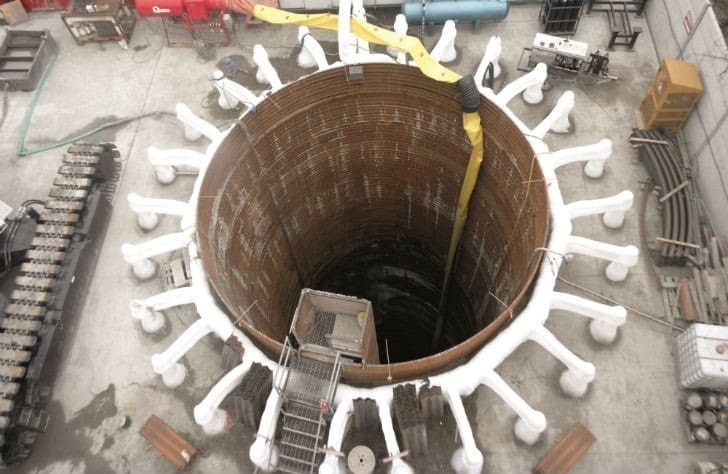 However, providing groundwater control and excavation support for shaft sinking remains the primary application. In fact, for deep shafts, no better method has yet been established. Ground where penetrability by drilling, jet grouting, clamshell excavation, or other vertical cut-off tools is limited. Filled ground and ground containing man-made obstructions. Virgin ground containing cobbles, boulders, or an irregular soil/rock interface. Ground that has been disturbed due to unstable conditions or water inflow. The major principle of this method is to convert the water into ice by external freezing methods to create a water seal and strengthen the soil. The effectiveness of freezing depends on the presence of water to create ice, cementing the particles and increasing the strength of the ground to the equivalent of soft or medium rock. If the soil has doesn’t enough amount of water to fill all to pore when they freeze, then it may be necessary to provide extra water so that the pores are complete sealed. This method is very effective in the places where the ground is made up of silts. Other methods of grouting cannot be undertaken due to very fine pores. The strength achieved by the ground after installing this method depends on freeze temperature, moisture content and the nature of the soil. After the initial freezing has been completed and the frozen barrier is in place, the required refrigeration capacity is significantly reduced to maintain the frozen barrier. When the ground water is transformed into ice, the expansion takes place which is negligible, around 9% expansion is observed which doesn’t impose any serious stress or strain on the soil. As this is an artificial method of refrigeration, a uniform freezing can be imposed on any type of soil which offers great security when compared to various grouting methods. As in all ground treatment techniques, adequate site investigation is necessary to allow the best system to be chosen and to design the appropriate array of freezing tubes and select plant of adequate power. Once the freezing process has begun, monitoring is required to ensure formation of the barrier wall and to verify when freezing is complete. During the drilling process, temperature-monitoring pipes are installed to measure the ground temperature. This type of freezing method is commonly used in every place for the stabilization of tunnel headings. In this method, a secondary coolant is circulated through tubes which are driven into the ground. The figure shows the schematic representation of indirect ground freezing method. Two coolants are used in this method. The first is the Ammonia and the second coolant is Calcium Chloride. The ammonia is compresses in the freezing unit and passes to cool down. The condenser cools down the ammonia from gasses form to liquid form. The water is cooled down in the cooling unit. This liquid ammonia is passed and the secondary coolant is cooled down by the liquid ammonia. The cooled brine solution is passed to the tubes driven parallel to the ground. This tubes freeze and the surrounding area of the ground is also freezes. This cycle is repeated till the required ground area freezes. The time required to freeze the ground will obviously depend on the capacity of the freezing plant in relation to the volume of ground to be frozen and on the spacing and size of freezing tubes and water content in the grounds. 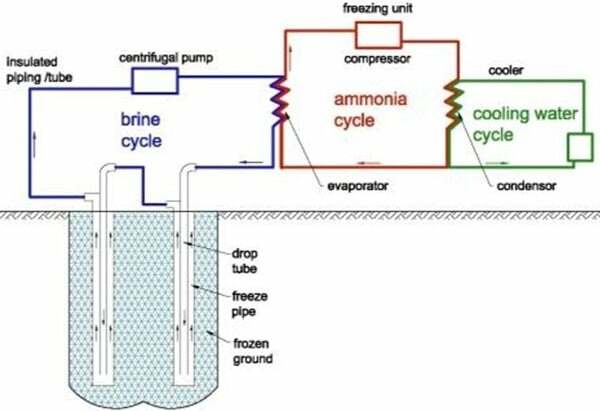 In this type of direct ground freezing method, only Ammonia is used in the freezing process. The process is same as that of indirect method, but here only one coolant is used. The ammonia is compressed and passed into the tubes driven into the ground. 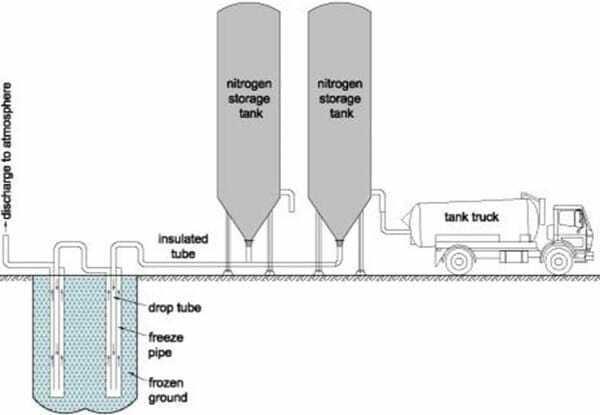 This ammonia freezes the tubes which in turn freezes the surrounding ground. Time required for this process is same as that of indirect process, but the efficiency is higher when compared to indirect method. The choice will depend on plant availability, estimates of cost and perhaps personal preference. This method doesn’t require ant refrigeration plant. Ammonia is brought to the site under moderate pressure and stored at site in insulated tanks. Tubes are driven into the ground with the provision of return pipes to exhaust to atmosphere. There is an advantage for emergency use, i.e. quick freezing without elaborate fixed plant and equipment. This may be double advantageous on sites remote from power supplies. In such conditions the nitrogen can be discharged directly through tubes driven into the ground, and allowed to escape to atmosphere. Precautions for adequate ventilation must be observed. The speed of ground freezing with N2 is much quicker than with other methods, days rather than weeks, but liquid nitrogen is costly. The method is particularly appropriate for a short period of freezing up to about 3 weeks. It may be used in conjunction with the other processes with the same array of freezing tubes and network of insulated distribution pipes, in which liquid nitrogen is first used to establish the freeze quickly and is followed by ordinary refrigeration to maintain the condition while work is executed. This can be of help when a natural flow of ground water makes initial freezing difficult. Temporary underpinning of adjacent structure and support during permanent underpinning. Shaft sinking through water-bearing ground. Shaft construction totally within non-cohesive saturated ground. Tunneling through a full face of granular soil. Volume expansion of water during freezing, leading to soil heave and thaw settlement.